"Whoah ... there are a lot of people out there!" "How many? Is my dad in the audience?" "A lot! ... Hey! Mr. Logan and his wife are here! Do you think they see me peeking?" "But is my DADDY out there?" "Um ... Oh, I see him! He's in the third row, one, two, three ... six seats from the left." "Rebecca! Hurry! Get in your place! Mrs. Weaver is about to pull the curtain!" When I was in kindergarten my class sang at a PTA meeting. What makes this event stand out in my memory is that there was a VIP in the auditorium, sitting about two rows from the back. When I saw this person I raised my right hand to about my waist and gave a tiny wave. I don't think anyone else on the stage noticed that VIP, but to me my mother was the most important person at McKinley School that night. I don't remember what song the group of not-yet-six-year-olds sang, but I can tell you that I sang loud and proud for my "audience of one." It has been a few years since I was six. Since that time I've had many different "audiences" that I've tried to please -- teachers, friends, neighbors, strangers, fellow drivers, creditors, bosses, the coworker who received the ChiaPet from me in the office gift exchange -- the list is endless. It would be impossible to try to please everyone all of the time. Unless it pleases everyone that I fail ... but I don't believe that is the case. 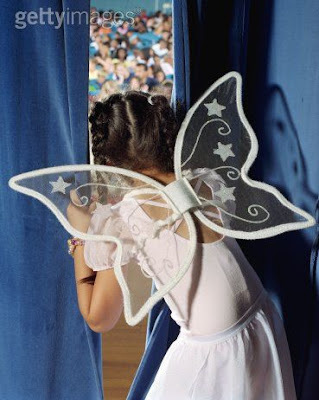 then let us wake up each morning, peek out from behind the stage curtain and acknowledge our VIP in the audience -- our Heavenly Father, our Audience of One -- and perform to please Him and Him alone. After all, it is His applause that should matter most to us.